A very interesting way to raise money for a good cause while enjoying a good beer. 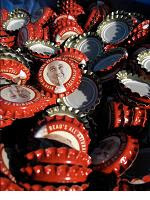 All you need is one of 100,000 Beau's beers that will have the special "Barry" cap and a camera and Facebook account. Hypenotic and Beau's Beer will together donate $2 to Not Far From the Tree every time you take a picture of yourself with a Barry Beau's Cap and tag it to Hypenotic's facebook page. The goal is to get creative photos of 1000 people with their caps so they can put that $2000 to good use by enabling Not Far From the Tree volunteers to pick Toronto's fruit trees and share the bounty.